Football (soccer) fans love their sport and support it well. Online gamblers love playing games of chance and betting on sports through their favorite online gambling sites. Football fans who love to gamble can enjoy the best of both worlds. It makes perfect sense that the online gambling industry has collectively decided to make a big investment in top soccer leagues like the Premiere League (UK), Bundesliga (Germany) and La Liga (Spain). For the online gambling industry, marketing and promotion are a real challenge. Regulators like the Malta Gaming Authority and the UK Gambling Commission have an obligation to set forth strict rules about how online gambling operators can reach out into the public domain with advertising. By aligning themselves with the world’s most popular sport, gambling operators are able to reach a large population of potential gamblers with a reasonable investment of capital. Today, they are looking to market through the Premiere league with the chance of expanding to Kiwis (New Zealand) and other nations and continents in the future. No one has to guess, the facts are in. The UK’s Premier League is the world’s most prestigious and popular football league. If an online gambling organization wants to invest precious marketing dollars into a football team or league, this is the best place to start. Every year, hundreds of millions of viewers from all over the world tune in to watch football matches between top world powers like Manchester City, Arsenal, Chelsea and Manchester United. The draw is a chance to watch the world’s best soccer players perform their magic on the pitch. The value of having a field banner hanging on the wall in plain view of hundreds of millions of fans watching from the stands or on the tele is immeasurable. And to think the banner deal pales in comparison to the value of a jersey deal. A jersey deal is where the real money sits. Very few fans are “equal opportunity” football fans. They usually have a strong affiliation with one team (maybe two) from their local community or via a team’s popularity among the population in general. When any advertiser buys a place front and center on a jersey in the biggest soccer league in the world, people notice. 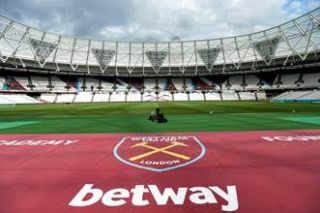 If an online gambling operator advertises on a West Ham United jersey (Betway), does the advertising inspire people to gamble? Most likely no. But if the person is predisposed to gambling online or already is an active participant, there’s a strong chance they will go straight to Betway. The fact is online gambling is one of the fastest growing industries on the Internet. Millions are joining the fun every year. Given the natural relationship between sports fans and sports gamblers, there may be no better place for an online gambling operator to invest its sponsorship dollars. Need evidence this is a growing trend? Nine Premiere League teams currently have major sponsorship deals with gambling concerns. The US’ NFL, NBA, MLB and NHL are seeing similar sponsorship deals coming to fruition. Gambling sponsorship in major sports is more than a trend. It’s a very smart way of doing business.